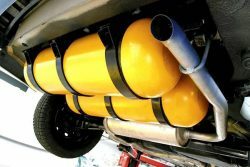 The Executive Director of Bolivia’s Execution Entity of Conversion to Natural Gas Vehicles (EEC-GNV), Alejandra Huaylla, reported in February that growth of natural gas vehicles in his country has been exponential. The national fleet has grown from 40,000 vehicles in 2005 to 390,000 vehicles today using Compressed Natural Gas (CNG), representing 25% of the entire Bolivian automotive fleet. “We can qualify this program as successful”, Huaylla says. EEC-GNV was created in 2010 and is in charge of the conversion, maintenance of kits, and requalification or replacement of CNG cylinders throughout the country. “Thanks to the NGV conversions the Bolivian State saved $ 2.1 billion dollars for gasoline imports in these years”, Huaylla notes. He also explained that the Entity this year launched its first invitation to conversion workshops to work within the program. “In January, we launched the first direct invitation to 80 workshops throughout the country, to be part of the NGV conversion program, of which 30 were awarded, 27 were observed and 23 were declared void. All this work aims to improve the security levels of Bolivian families and provide a better quality service and efficiency to the carrier.” A second invitation was issued in February.